WHY WE LOVE IT: With an education system centered around assessments, Lucas and Claxton point out some of the flaws with modern day education and offer an exciting vision for the future. DESCRIPTION FROM THE PUBLISHER: With forewords by Professor Tanya Byron and Octavius Black, Educating Ruby: what our children really need to learn is a powerful call to action by acclaimed thought-leaders Guy Claxton and Bill Lucas. It is for everyone who cares about education in an uncertain world and explains how teachers, parents and grandparents can cultivate confidence, curiosity, collaboration, communication, creativity, commitment and craftsmanship in children, at the same time as helping them to do well in public examinations. 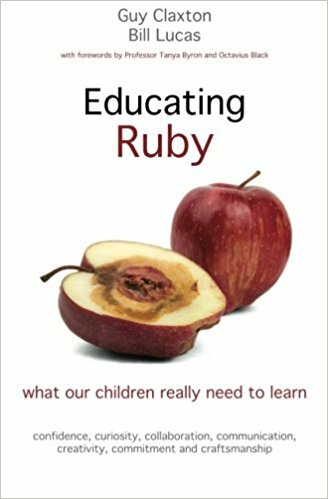 Educating Ruby: what our children really need to learn shows, unequivocally, that schools can get the right results in the right way, so that the Rubys of tomorrow will emerge from their time at school able to talk with honest pleasure and reflective optimism about their schooling.